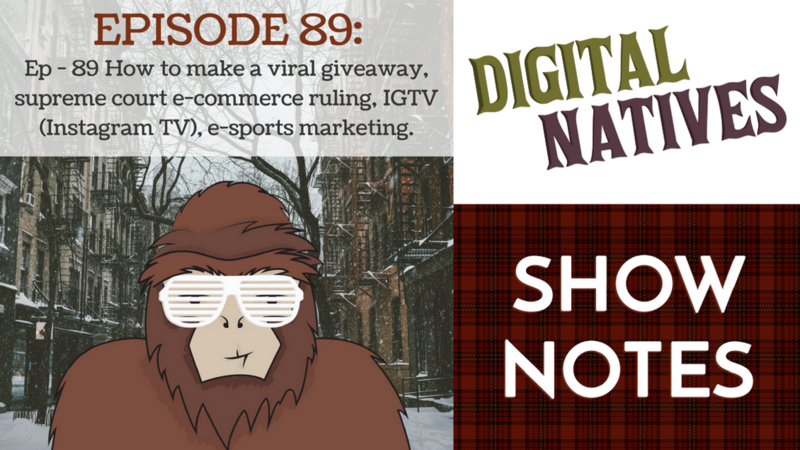 This week on Digital Natives, Kyle, Min, Will, and Mitch talk about tips to creating a viral giveaway, the supreme court ruling on e-commerce taxation, what’s new with Instagram TV, and the rise of e-sports and its marketing. Mitch shares 4 tips for creating a viral giveaway. Kyle brings up the supreme court ruling and how it may affect our economy. Min shares what’s new with Instagram and its new app called IGTV. Will shares news about a new marketing firm for e-sports and where the industry is going.